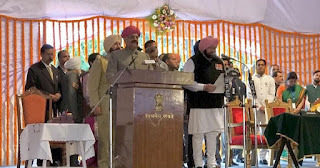 Captain Amarinder Singh took oath as the 26th Chief Minister of Punjab on Thursday in a ceremony attended by senior Congress leaders, including former prime minister Manmohan Singh and party vice-president Rahul Gandhi. The oath was administered by Punjab Governor VP Singh Badnore at the Raj Bhavan. Sworn in along with Amarinder were cabinet ministers Navjot SIngh Sidhu+ , Manpreet Badal, Brahm Mohindra, Charanjit Channi, Rana Gurjit and Tripat Bajwa; Aruna Choudhary and Razia Sultana were sworn in as ministers of state with independent charge. Two days before the ceremony, the Punjab Congress had said it would be a simple affair as an austerity measure. "There will be nothing ostentatious about the oath-taking programme at the Raj Bhavan on Thursday morning, when Punjab Governor V P Singh Badnore will administer the oath of office to Amarinder Singh as the new chief minister of the state," Punjab Congress had said on Tuesday. 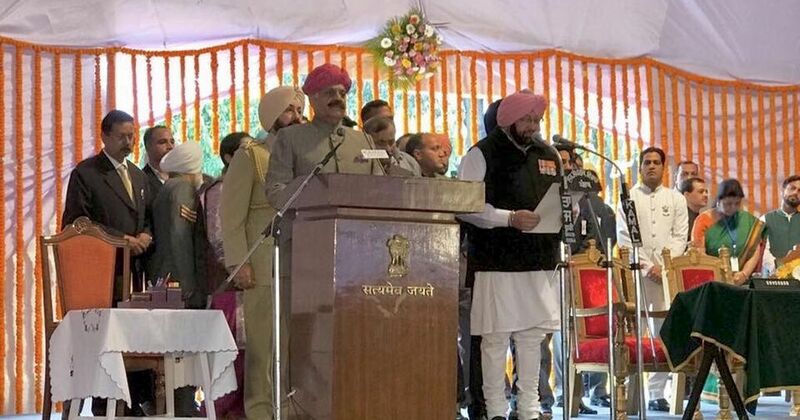 This is the second time that Singh takes oath as chief minister, having served in that capacity in 2002-2007. Riding on strong anti-incumbency, Congress stormed to power in Punjab after a gap of 10 years by winning 77 seats in the 117-assembly seats of the Vidhan Sabha.